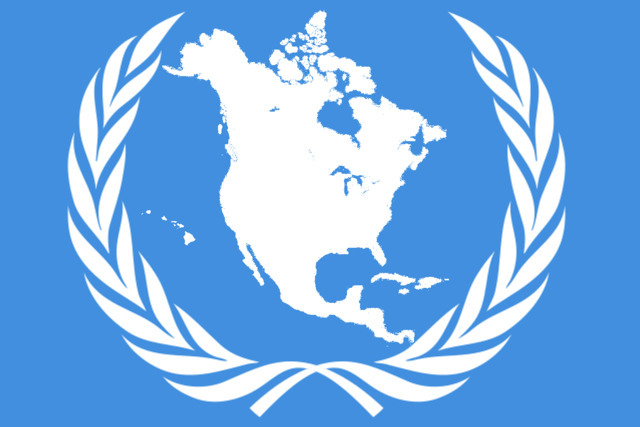 The North American Union (NAU) is a member state of the United Nations, founded by a treaty of union ratified by the ten nations that existed on that continent in the late 21st Century A.D. The new nation came into existence on January 1, 2100, the first day of the last year of the 21st Century. The national capital is Denver, located in the state of Colorado. There are 106 states, and each state has two senators, for a total national senate of 212. Representatives are apportioned every ten years so that each national representative stands for approximately 100,000 constituents. At the time of union, the first NAU census found a national population of just over 700 million people, so the number of national representatives from 2100-2110 was fixed at 7000. NAU Representatives, Senators, Judges, and the President are all elected by direct popular vote, and may all be recalled by popular vote or impeached by Congress. There is no Electoral College. There are no term limits except for presidents, who are limited to a maximum of two four-year terms. All rights guaranteed in the constitution of any nation that joined the Union is guaranteed in the Union's constitution, as well. Anyone born in the territory of the North American Union is a citizen of the North American Union. If any law of the NAU conflicts with a law of the United Nations, the U.N. law supersedes the NAU law. Regions are ceremonial vestiges of the nations that united to form the NAU. Though they retain their former capitals and maintain their monuments and cultural significance, the real political power lies at the national and state levels. According to the Constitution, the people of the States formed the Union by popular vote. CAN — Former provinces and territories of the Republic of Canada (13 total). Regional capital: Ottawa (not part of a state). IND — Independent nations that weren't part of Canada, the US, or Mexico before they signed the treaty of union (7 total). No regional capital. MX — Former states of Estados Unidos Mexicanos (31 total). Regional capital: Ciudad de México (not part of any state). US — Former states of the United States of America (55 total). Regional capital: District of Columbia (not part of any state). There are over a dozen political parties in the NAU, but most of them matter only in a single region. There are only four that matter at the national level: The Socialists, the Liberals, the Greens, and the Social-Democrats. Each state has its own state government, usually with its own bicameral legislature, usually called the Assembly and Senate, though not always; its own state judges; and its own executive, usually called the state Governor. State business is conducted in the state capital.